Joint Special Envoy of the United Nations and the League of Arab States on the Syrian Crisis, Kofi Annan. Briefing the Council today, Mr. Pascoe said that the cessation of armed violence in Syria remains “incomplete” and human rights violations are still perpetrated with impunity. He also noted that little progress has been made so far on allowing the full and unimpeded access and increased capacity of agencies on the ground required to ensure the timely provision of humanitarian assistance. “We urge the Government to take all necessary steps to facilitate the humanitarian response, as one million people are in need,” he said. The violence in Syria, which began in March last year as a protest movement similar to those witnessed across the Middle East and North Africa, has claimed over 9,000 lives, mostly civilians, and displaced tens of thousands of people. On Saturday, the Council authorized the establishment of the UN Supervision Mission in Syria (UNSMIS), comprising an initial deployment of up to 300 unarmed military observers as well as an appropriate civilian component, for an initial period 90 days. The observers will be tasked with monitoring the cessation of violence, as well as monitoring and supporting the full implementation of the six-point peace plan put forward by the Joint Special Envoy of the UN and the League of Arab States for Syria, Kofi Annan, who, in an earlier statement, stressed that the Council’s decision represents a “pivotal moment” for the stabilization of the country. “I urge all forces whether governmental, opposition or others to put down their weapons and work with the United Nations monitors to consolidate the fragile cessation of violence in all its forms,” Mr. Annan said on Sunday, adding that the Government in particular must stop the use of heavy weapons and withdraw such weapons and armed units from population centres. Mr. Annan’s plan calls for an end to violence, access for humanitarian agencies to provide relief to those in need, the release of detainees, and the start of an inclusive political dialogue. “The work of the mission should help create the conditions conducive to launching the much-needed political process, which would address the legitimate concerns and aspirations of the Syrian people,” Mr. Annan said. “I call on the Government and the opposition and all the people of Syria to prepare to engage in such a process as a matter of utmost priority,” he added. Mr. Annan is scheduled to brief the Council on Tuesday. 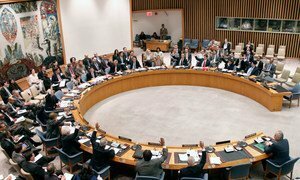 The Security Council today authorized the establishment of a United Nations observer mission to Syria, for an initial period 90 days, to monitor the cessation of violence there, as well as monitor and support the full implementation of a peace plan.